Whether it’s a brick-and-mortar business, a financing company, or e-commercestore, entrepreneurs and small business owners are out there handling their clients, employees, and everything in between. Popular industries for startups in 2018 included healthcare, e-commerce, technology, marijuana and maintenance (LendEDU, 2018). 23% of small businesses in the U.S. are located in the south (StartBlox, 2018). The majority of small-business owners say their employees stay with their business for at least four years (NSBA, 2017). 25% of small companies with 500 employees or less are more than 20 years old (Wall Street Journal, 2015). 66% of small businesses will outsource services to other small businesses (FreshBooks, 2017). Over 50% of small businesses have a Chief Financial Officer (Wall Street Journal, 2015). It only takes 6 days to start a business in the U.S. In China, it takes 38 days (Dynadot, 2014). The average amount of a startup’s capital is $10,000 (Digital, 2017). 45% of minority-owned businesses have fewer than 20 employees (Kabbage). There are 9.9 million women-owned businesses in the U.S. and 14.8 million male-owned businesses (StartBlox, 2018). Small businesses owned by American Indians and Alaska Natives increased by 15% between 2007 and 2012 (Kabbage). The number one motivation for someone to open their own business was that they’re ready to be their own boss (Guidant Financial, 2019). 53% of small business owners ranked their happiness at 9 or above in their roles of owning a business (Guidant Financial, 2019). Over one-third of small business owners feel very confident about the future of their business (NSBA, 2017). 42% of self-employed professionals are not planning for retirement (FreshBooks, 2017). The majority of small business owners are males at 73% (Guidant Financial, 2019). Entrepreneurship in women grew by 114% between 1997 and 2017 (Fundera, 2018). 12.5% of entrepreneurs in the U.S. are immigrants (Crowdspring, 2017). 95% of entrepreneurs have a bachelor’s degree (Serious Startups, 2014). Business owners with student debt had smaller ventures (SBA, 2014). 69% of entrepreneurs in the U.S. start their business at home (Small Business Trends, 2016). Having two founders increases the odds of success for a small business as opposed to having one (INC, 2015). 82% of startup funds come from the entrepreneur, or family and friends (Small Business Trends, 2013). The median income for a small business owner is $59,000 (Digital, 2018). Entrepreneurs who own a home are 10% more likely to start a business than those who don’t (Fundera, 2017). 54% of small business owners worry about finding hires with great talent (Salesforce, 2018). The number one marketing goals for a small business is driving sales. This is followed by retaining and engaging customers (Statista, 2018). 70-80% of people research a small business before visiting or making a purchase from them (Blue Corona, 2018). Social media is the leading tactic in a small business marketing strategy (Statista, 2018). 61% of small businesses invest in social media marketing (Clutch, 2018). 92% of business owners believe that having a website is the most effective digital marketing strategy (Iron Paper, 2018). 83% of small business owners with a website feel a competitive advantage to those without one (GoDaddy, 2015). 89% of small business owners believe using search engine optimization is the most effective digital marketing strategy (Iron Paper, 2018). 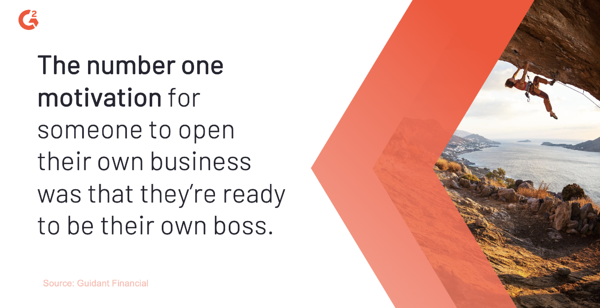 47% of small business owners handle marketing on their own (Clutch, 2018). About half of small businesses spend 2 hours or less on marketing per week (Iron Paper, 2018). 30% of small business owners say that keeping up with technology is a major concern (Blue Corona, 2018). The cost of health insurance is the biggest challenge to the survival of a small business (NSBA, 2017). 50% of new businesses fail within their first five years (INC, 2015). Startups have a 37% success rate after their first four years (Serious Startups, 2014). 58% of finance, insurance, and real estate startups still operate after four years (Small Business Trends, 2018). In the U.S., the main obstacle to the success of a small business is generating new business (Statista, 2018). 43% of cyber attacks target small businesses (Digital, 2017). 60% of small companies that get hacked close within 6 months (Cyber Security Ventures, 2019). 82% of businesses fail because of cash flow problems (Fundera, 2107). 46% of small businesses fail because of incompetence (Small Business Trends, 2018). 74% of tech startups fail because they scaled too fast (Crowdspring, 2017). 14% of small businesses fail because they ignore their customers (Fundera, 2018). 42% of small businesses fail because there’s no market for their product or service (Blue Corona, 2018).